During December, we had a few of our youngest alpacas move to their new homes. They are settling in well, and their new families have sent pictures. 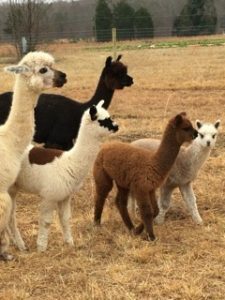 Our fall crias, Zorro, Silver Myst and Chocolate Eclair have moved with their moms and the ‘heart of our farm’ Lystra (one of our first alpacas, and mother to Lord Tennyson and many other alpacas). They are are settling in and enjoying exploring the farm and getting to know their new people. Our spring crias, best buddies Hawkeye and Gandalf moved to join Gabriel and Joshua in their North Carolina home. The younger boys were born after the older boys had moved, so they took a little while to get to know each other with a lot of sniffing and staring. 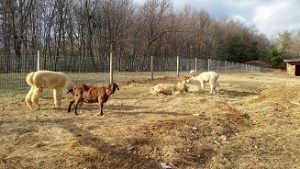 By the end of the day, all four boys and the goats were hanging out and sharing hay.